Ellen DeGeneres shared that Vanity Fair called Martin Short one of the most beloved comedians. She was more than happy to welcome him to the show. As he sat down, Martin said Ellen’s show just gets better and better. He said there’s no one more interesting than Ellen and joked that she should tell everyone what she was saying before the show about why it’s too early for a woman president. Ellen said Martin keeps growing in all sorts of different directions, pointing out that Martin Short even has his own stamp now. It’s a Canadian stamp honoring various comedians. He shared that he is an American citizen as well as a Canadian citizen. He said America and Canada are actually very similar, and said that Canada even has a national debt as well, but theirs is only $6. Ellen said Canada is clean, there’s little crime, and there’s even national health care. She said she’s never met a Canadian that wasn’t nice. Martin said people think Canadians are nice when really they’re just hammered. Ellen also said the last time Martin was on the show, he was writing a book, and now that book is coming out November 4. It’s titled I Must Say and includes both funny and touching stories. Ellen pointed out that Martin talks about his late wife in the book. Martin shared the story of when he and his wife went to Hawaii and they were body surfing when suddenly a wave hit them, sending them flying into the air and then onto the sand. He said when they got up, they both realized that the top of his wife’s bathing suit was missing. Ellen then asked Martin Short about the story she heard about Robin Williams. Martin explained that Robin was one of the sweetest souls in the world, and in 1980 Martin was doing a series called I’m A Big Girl Now. He said they were about to start but then SAG went on strike. He said Robin came up and spent a week with them, but came with only a credit card and no clothes, because the trip was spontaneous. He said that when Robin was at the theater, he had fallen and stained his pants, so that night while he was sleeping, Martin’s wife washed Robin’s pants. When Robin Williams put the pants on again, they were quite a few inches too short. Ellen then played a clip of Martin Short in his new Fox series Mulaney. Martin explained that the show is about John Mulaney, who plays a young New York writer. In the first episode, John auditions for the role of a writer for a legendary comedic star who now has a hit daytime game show. That comedian is Lou Cannon, played by Martin Short. 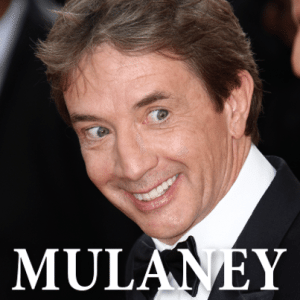 Martin Short said the show is really funny, and said his catch phrase on the show is “You guessed it.” Ellen asked what his catch phrase would be in real life if he had one and he said “It’s better to have loved a short than to have never loved a tall.” If you don’t get it, try saying it out loud! That’s a good one! Ellen: Martin Short Heads Up! Ellen then played a game of Heads Up with Martin Short where he had to give Ellen clues to try to get her to guess what famous person he was talking about. Martin Short helped Ellen correctly guess Nicki Minaj, Taylor Swift, George Clooney, Barbra Steisand, Jay Z, and One Direction.